A reliable source for Climate Chambers information and a resource for accessing leading Climate Chambers and suppliers. Climate Chambers Climate chambers differ vastly in size ranging from walk-in chambers to small chambers. Most climate chambers are equipped with video feeds, allowing the operator to observe the product or component during the testing process. Russells Technical Products has been designing and manufacturing environmental test chambers since 1972. Our company provides its customers with quality environmental test systems and advanced manufacturing techniques. For over 75 years, Cincinnati Sub-Zero (CSZ) Products has designed, manufactured and serviced custom and standard environmental test chambers that exceed customers' expectations. Hastest Solutions designs, manufactures and provides solutions for all environmental testing needs. For the full range of environmental test chambers, including HAST, temp/humidity, salt fog, solar radiation, high temp ovens, autoclave, and more. Weiss Technik is a worldwide leader in the design and manufacturing techniques of environmental test chambers. We offer a complete line of standard and custom chambers, from bench top models to full walk-in and drive-in solutions. 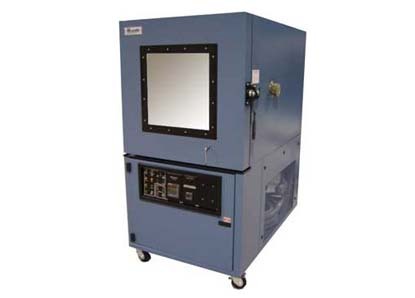 Innovative design, robust construction, and superior performance make the Tenney line of environmental test chambers and rooms ideal for all of your temperature, humidity, altitude, vibration, steady state, thermal shock applications and more. Parameter Generation & Control’s environmental test chambers feature our unique humidity control system, which enables the user to attain unsurpassed levels of RH/temperature control and uniformity. Bahnson Environmental Specialties is a leading manufacturer of environmental test chambers and we have experiences dating back to 1972. We aim to be your single-source for all of your environmental test chamber needs. Climate chambers are also known as environmental chambers or climatic chambers. They are used to determine the effects of different environmental conditions on certain products or components, including industrial, biological, electronic, pharmaceutical, and other products. Climate chambers can be used as stand-alone testing equipment to prepare specimens or products for further testing, or they can be used to actually conduct the tests on the products or specimens. 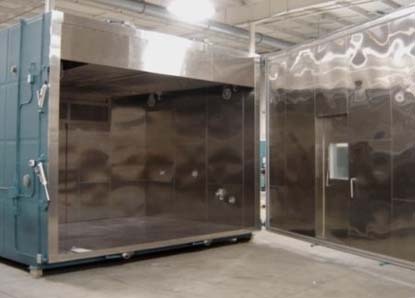 The purpose of the climate chamber is to mimic the environmental conditions a particular product may be exposed to during its normal use and to push the limits of the product. These conditions include thermal shock, extreme temperatures, altitude, humidity, radiation, and corrosion among others. When choosing a climate chamber, there are certain points to consider. The first is the temperature range of the chamber. Standard chambers can reach temperatures as high as 375°F or 190°C and can cool to temperatures as low as -30°F or -34°C. For higher or lower ranges than the normal, contacting the manufacturers will be the best option. The second thing to consider is the humidity range of the chamber. Other things to consider would be the temperature change rate, the product in the chamber, the construction, and the type of cooling system (air cooled or water cooled) in the chamber. These will help you determine the best chamber for your application.